Representative, moderate-angled slopes around Angle Peak and Angle West. 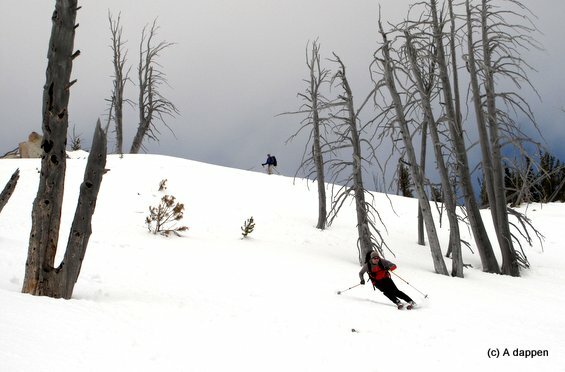 The peaks flanking the Entiat River are the most overlooked ski hills of Central Washington. 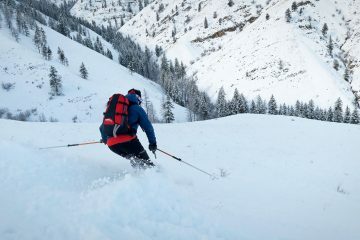 That’s good news for those of you who don’t want to share the area’s big bowls and long ridges with others who would mar the perfection of the tracks you scribble in the snow. Besides the likelihood of having the Sun-Valley-like bowls and ridges to yourself, the scenery of the area isn’t shabby either. Most of the peaks flanking the Entiat River are neither as high nor as muscular as those bordering the Icicle River, but the tallest soldiers standing guard here still rise more than a vertical mile skyward and they’ll have you pulling out the smart phone to work on your iPhoneagraphy skills. Stormy Mountain is one of the Entiat peaks well worth a visit that we included earlier in the guidebooks. 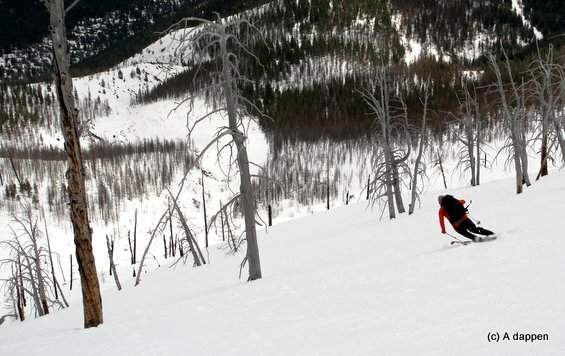 On April 21, 2012, Coron Polley, Tom Janisch, and I picked another Entiat plum by skiing a 7102-foot peak 5.5 miles northwest of Stormy on the same ridge system. For the lack of a better name (the topographic map only notes the peak’s elevation) we called it Angle West because Angle Peak (6,735’) is one mile away on the same ridge system and is the nearest named peak. Between Angle Peak proper and Angle West we found a half dozen south-facing bowls, some that delivered nearly 3,000 vertical feet of fall line skiing, others that were quite intermediate in pitch, and others still that would qualify as black diamond runs at a ski area. By the time we left, the only tracks in all of these bowls were our three thin lines. 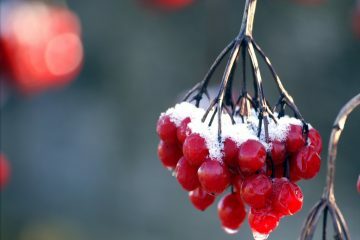 Best season. 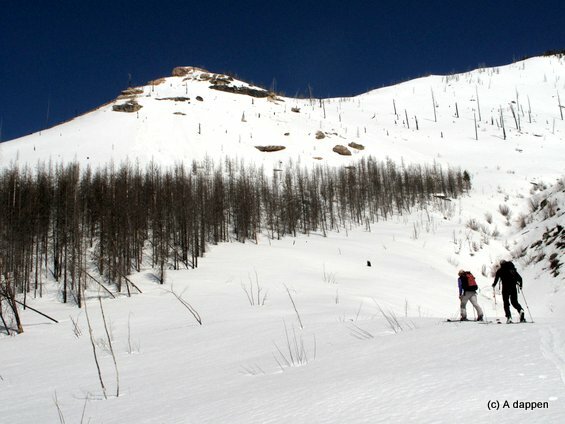 We visited these slopes in latish April when we could drive the Forest Service roads up to about 3,200 feet and access the bowls without skiing miles of low-angle roads on the approach. 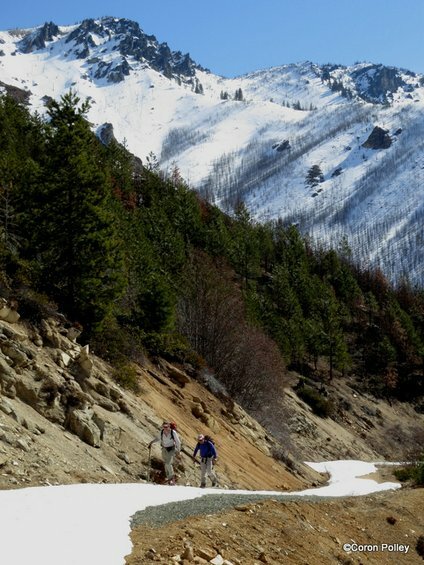 This particular winter had a bigger snowpack than average (perhaps as much as 25 percent above normal) so, on an average year, late March might be a good time to visit. 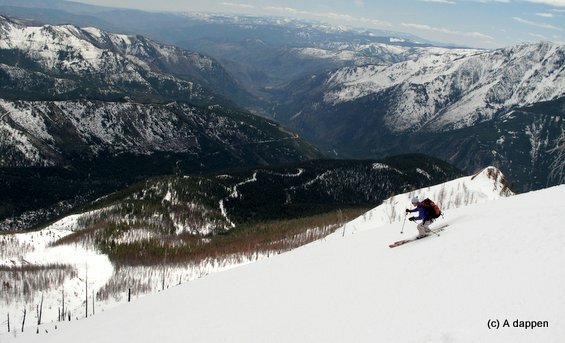 For winter skiing the best season is likely to be mid-January through February. At such times you’ll be parking at the bottom of the Preston Creek Road. If snow coverage allows it, use the cross-country bearing noted on our map to climb directly to the ski bowls up high. Photo: The road providing a ribbon of white leading to the bowls of Angle Peak. Fitness: In spring: 2 to 2+ (we gained 3,800 vertical feet). In winter: The elevation gain from the bottom of the Preston Creek Road to the top is nearly 5,500 feet vertical feet making the recommended fitness level a 3 (advanced). Access. From Highway 97-A near the town of Entiat, turn onto the Entiat River Road and drive up river. About 0.75 miles beyond the tiny settlement of Brief, Preston Creek Road comes in on the right. You’ll park here in winter (approximately Milepost 22.5) — the county plows a small parking area at the bottom of the Preston Creek Road (Forest Road 5501, elevation 1,770’). No permit is required. 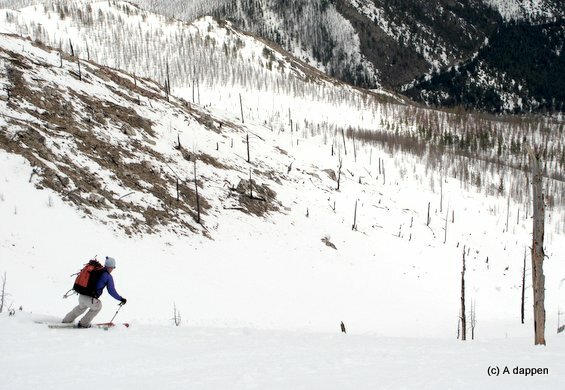 If you’re arriving in March or April for the corn skiing, turn onto the Preston Creek Road and follow it uphill for 2 miles until a road intersects on your left. Turn left here and follow the Brennegan Creek Road for 2.2 miles to an intersection at an elevation of 3,210 feet. This is where we parked (no permit needed). Snow on the road could force you to park earlier. Winter skiers should leave the Preston Creek Road at its bottom and climb south-facing slopes upward following a true bearing of 7 degrees. 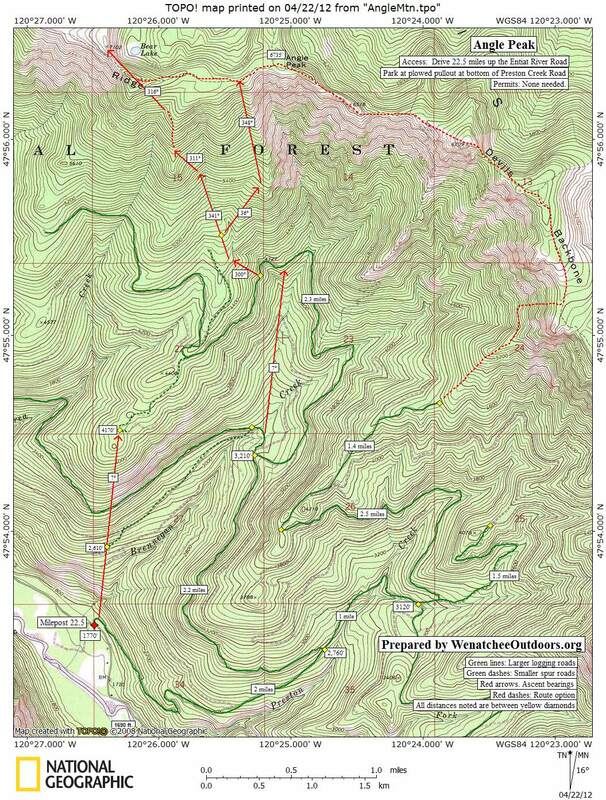 At 4,100 feet, follow the ridge system and old logging roads in a northeasterly direction to 4,600 feet, then pick up the spring route shown on the map at this elevation. Spring skiers can either follow the road as shown on our topo map to the 4.150 feet or use our bearing to walk/ski/snowshoe in a direct line upward. 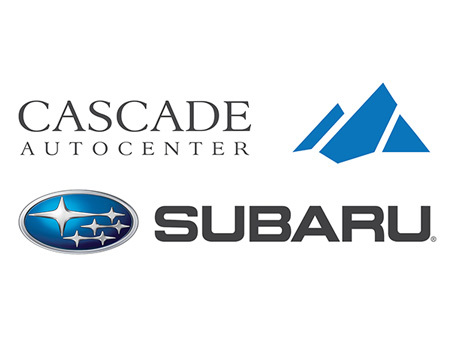 You’ll re-connect with the road up around the 4,100-foot level. At the 4,130-foot level of the road, leave the road and use the bearings on our topographic map to climb directly up to Peak 7,102 (Angle Peak West). Map. See our topo map of this route above. Descent. The possible lines down are many. We followed our ascent route back to the road at 4,130 feet because the snow was deepest along this route and gave us continuous skiing to the road (some of the lower slopes were burned off elsewhere). The road was thinly covered with snow but we were able to glide almost all the way back to the car with just a few bare sections that we walked across. Allowed. Snowmobiles are allowed on the Preston Creek and Brennegan Creek roads. On winter weekends you’ll encounter snowmobiles on the road but the this road system is usually not heavily used. In spring as the low snow burns off, snowmobilers stop using these roads altogether and head to trailheads farther up the Entiat River. Hazards. As always, pay attention to the avalanche hazard. There’s a lot of terrain here of different steepness and, in most conditions, you can find routes upward that are safe. Poor route selection, however, can certainly put you on slopes that do slide. Photo: Which of these skiers, Coron Polley above or Tom Janisch below, is the ex-racer? Hmmm.